Join us to have fun with textiles and stitching, explore colour and learn stitching techniques to use in your projects. Textile collage and stitching themed around birds, butterflies and insects. 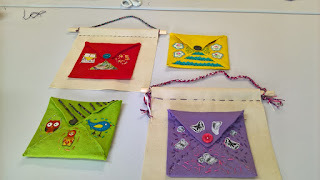 The new Young Embroiderers group at Grantham stitched birds, and butterflies in their 2nd session. We had some new faces attending as well as some who returned. Although the subjects were challenging, the children and young people, with some help from our wonderful volunteers, created works of art that were exceptional in the time frame we had. Wendy and I had prepared some inspiration boards and a variety of books to enthuse and help the group get started. There were options to colour a background with textile crayons or choose a patterned fabric background. The group then drew simplistic shapes and chose fabrics to cut and appliqué onto their background fabrics. It was a case of going with the flow and enabling the pictures to form as the young people wanted. Some started and then changed as the fabric and stitch dictated. We attempted to introduce feather stitch as a new learning point and this was tried by some. Everyone worked so hard and lunch time arrived so quickly; everyone needed a break and time to relax. At the end of the session there were amazing achievements. Well done all! Our first workshop was both fun and good learning for everyone involved. We centred our project on running stitch and created felt envelopes to store a variety of items, really whatever you wanted. the stitches had plenty of choice by choosing colour combinations for felt and lining, a huge variety of threads and some inspirational visual materials to get us stitching. It was lovely to see the enthusiasm during the day and the results were all well deserved. See more pictures here. We are hoping that the group will be able to come together in August for another project.